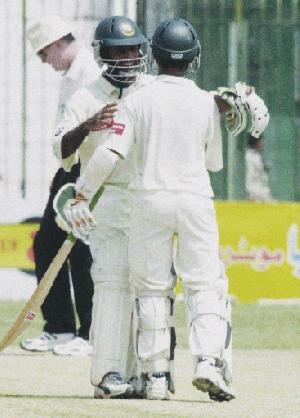 After struggling for two and a half years, Bangladesh opener Javed Omar finally succeeded in getting his maiden Test hundred. The extreme heat in Peshawar on the second day of the second Test forced the umpires to allow two drinks breaks to be taken in each session instead of one. Former South Africa cricket coach Bob Woolmer has branded his five-day course with the Bangladesh's under-19 boys as a 'learning discovery' for them. Defending champions Mohamme-dan Sporting Club take on Arambagh Krira Sangha as the 'Super Six' phase of the Nitol-Tata Third National Football League resumes today after a day's recess. Powerful right-handed Australian batsman Damien Martyn has joined Yorkshire for the remainder of the English county season. England captain Michael Vaughan was described as "totally out of order" by Worcestershire chairman John Elliott on Wednesday after he slammed the state of county cricket earlier this week. Andy Roddick has dominated men's tennis since Brad Gilbert took over as his coach, rising to the top of the ATP Champions Race and rivaling Gilbert's former pupil, world number one Andre Agassi. Serena and Venus Williams were too hurt to play tennis at the US Open, but not too injured to appear on television shows here Wednesday and declare the Grand Slam event diminished by their absence. Hicham El Guerrouj and Ana Guevara have suffered Olympic disappointments but here on Wednesday they put on a royal show as the former won the men's 1,500 metres while the latter took the 400m. Celtic and Rangers did their country proud on Wednesday night to earn Scotland a double dose of lucrative Champions League football.